WEST PALM BEACH, Fla. (AP) Brad Peacock went into spring training last year with the Houston Astros worried he wouldn’t make the team. After the best season of his career, the right-hander’s spot with the club is now secure. Even so, he’s maintained the same mindset he had when his career was on the line. ”I still want to keep that edge on me,” he said. Out of options after four unimpressive seasons in Houston, things didn’t look good for Peacock this time a year ago. But his solid spring, coupled with some injuries, gave him one more chance to prove himself with the Astros. He more than took advantage of the situation, winning 13 games after getting just 11 wins combined in his first five major league seasons. His 3.00 ERA and 161 strikeouts were also the best of his career, and he appeared in a career-high 34 games. Peacock opened the season as a reliever, but took a spot in the rotation when injuries began to pile up in May. He won eight games from June 4-Aug. 4 to steady Houston’s pitching staff until everyone got healthy. He started one game in the postseason and came out of the bullpen for six more. He pitched in four games of the World Series and finished with a 2.45 ERA and eight strikeouts to help the Astros beat the Dodgers for their first title. Peacock credits his success last year to changing almost everything after he’d struggled to be consistent for years. Now that he’s found success, he’s staying with the same approach both physically and mentally. Manager A.J. Hinch isn’t surprised to hear how Peacock is treating this spring. Peacock has bounced between the bullpen and the rotation for his entire career and could be in the same role this season. With an overabundance of starters, Peacock will likely open the season as a reliever, but could be the first option if Houston needs a spot starter. Despite the uncertainty, the 30-year-old isn’t concerned with what his role will be. ”I’m just glad to be here and glad to help out any way I can,” he said. He acknowledged that he likes starting, but knows that he’s an easy person to move into the bullpen because of his ability to warm up quickly. After revamping everything last season, this year Peacock is just tweaking a couple of things. His focus is working on throwing more changeups to left-handed batters. He’s been reticent to throw them in the past because he feels like he tips those pitches and hitters know what’s coming. He hopes he can fix that this spring so he’ll be able to add it to his arsenal in the regular season when he tries to build on last year’s success. 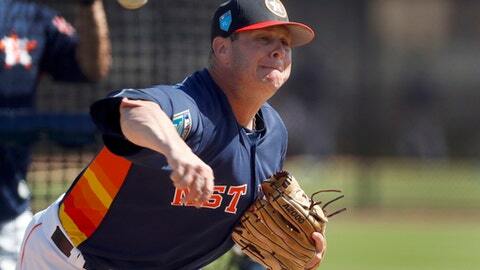 Peacock is excited to see what this pitching staff, which features Dallas Keuchel, Justin Verlander and Gerrit Cole, can do and hopes he can do his part to help the Astros contend for another championship.